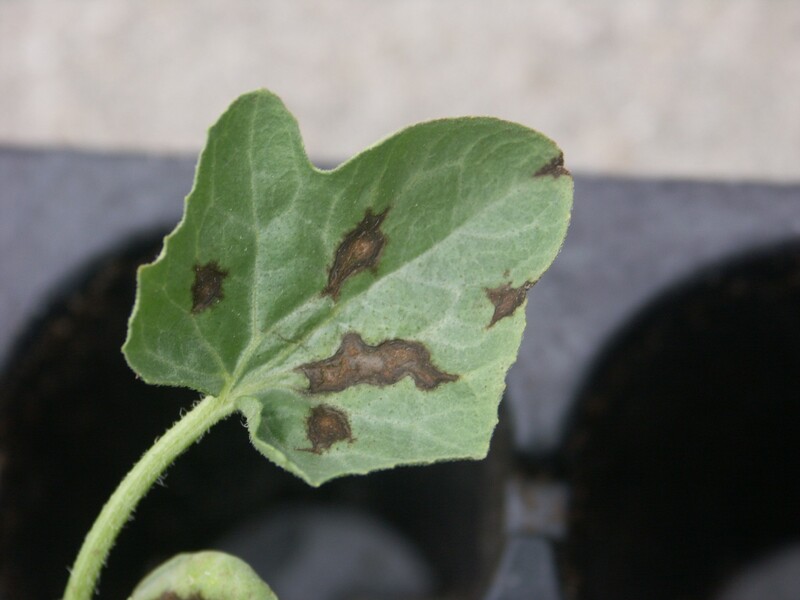 Gummy Stem Blight – this fungal disease causes dark brown leaf spots, however, the diagnostic feature of this disease is the water soaked lesion that is often formed under one of the seed leaves (cotyledons). 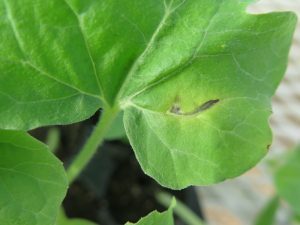 Such lesions often start at the point where the seed leaf joins the stem (hypocotyl) and do not extend to the soil line (Figure 1). In time, these lesions turn a light brown in color and appear ‘woody’. If one inspects the woody stem closely, it is possible to see dark specks imbedded in the stem—these are fruiting bodies of the fungus and will exude numerous spores when wet. Gummy stem blight affects both cantaloupe and watermelon. Figure 1. Water-soaked lesion on watermelon transplant typical of gummy stem blight. The fungus that causes gummy stem blight may be seed borne. The fungus may also survive on the residue left on contaminated transplant trays, the greenhouse floor or bench. Gummy stem blight may spread rapidly from plant to plant under warm, wet conditions. Anthracnose – the leaf lesions caused by this disease tend to be angular and jagged (Figure 2). Stem lesions are not common but if present, are often long and may be sunken. Lesions may extend to the soil line and may be mistaken for damping-off symptoms. When moist, lesions caused by anthracnose may become an orange or salmon color. Anthracnose affects both cantaloupe and watermelon. Figure 2. Anthracnose lesions on watermelon are often angular. Anthracnose is easily splashed from seedling to seedling. The causal fungus may be seed borne or, like the gummy stem blight fungus, survive on contaminated surfaces. Bacterial fruit blotch – The primary difference between the lesions caused by this disease and the fungal diseases described above is that bacterial fruit blotch (BFB) causes a water soaked leaf lesion (Figure 3). Early lesions may appear as water soaked spots. Older lesions may be brown with a water soaked margin. Lesions often start on seed leaves. The symptoms of BFB are similar to angular leaf spot (ALS). It is important to get an official diagnosis since BFB is a significant disease, while ALS is of minor importance. Bacterial fruit blotch affects both cantaloupe and watermelon. BFB thrives under warm, wet conditions. Symptoms of BFB on leaves in the field may easily be missed until the dark, water soaked lesions on the fruit are observed. 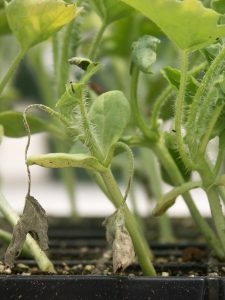 The primary method of introduction of BFB to the greenhouse or field is through seed contamination. Figure 3. Lesion of bacterial fruit blotch on a watermelon transplant. 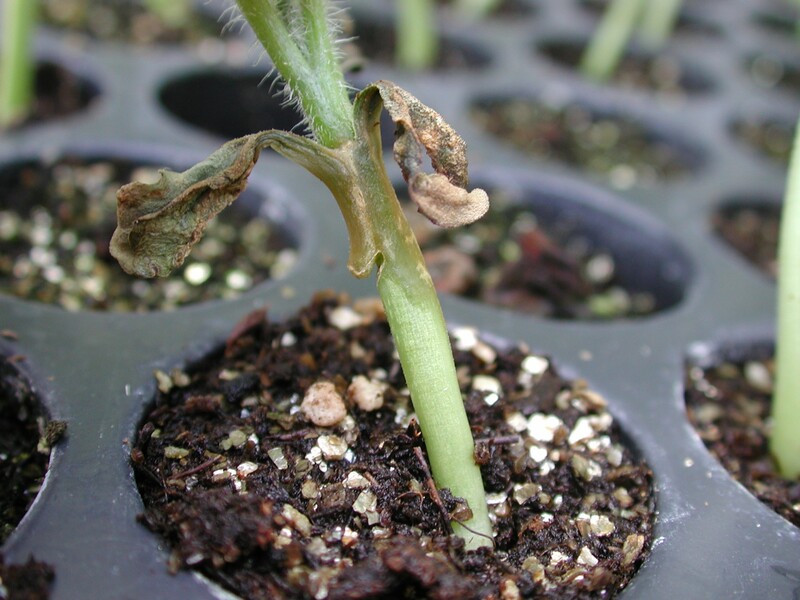 Fusarium wilt of watermelon – the first symptom of this disease in transplants is that affected seedlings wilt even though the soil is moist (Figure 4). While Fusarium wilt on older plants is often recognized by a one-sided wilt, seedlings seldom exhibit this symptom. Similarly, while older plants with Fusarium wilt can be recognized by a vascular discoloration inside the lower stem, it can be difficult to recognize this symptom in seedlings. Figure 4. Fusarium wilt on a watermelon transplant. Fusarium wilt of watermelon may be seed borne. However, the resilient spores survive well in the absence of a watermelon host for many years in the field or on unwashed transplant trays. There is preliminary evidence for a limited spread of Fusarium wilt in the transplant greenhouse. Damping-off – the classic symptom of damping-off is the constricted, discolored lower stem (Figure 5). 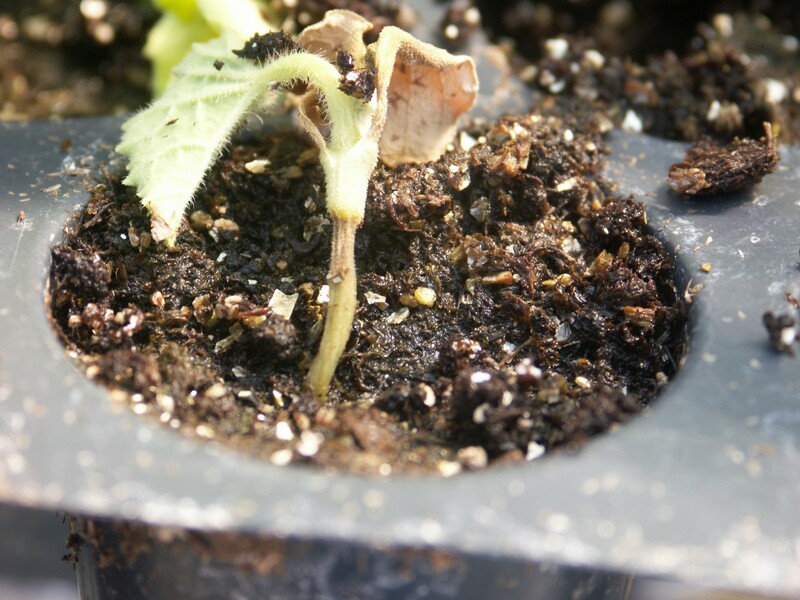 The seedling subsequently collapses and dies. Wilt is another common symptom that results from affected stems and roots. The base of stems may appear red-brown in color. Seedlings may also die before emergence. There are several fungi which may cause damping-off, all of which have many hosts and survive well in soil. These diseases are not seed borne, but the fungi involved survive well on transplant trays and implements. Damping-off does not spread from plant to plant. Cool, wet conditions favor damping off. Figure 5. 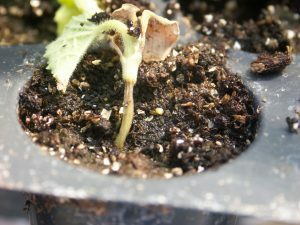 Damping-off of a cantaloupe seedling. Management – Here are some points to remember for the management of these diseases. Purchase seeds that have been tested for seed borne diseases such as gummy stem blight, anthracnose and bacterial fruit blotch. Avoid planting diseased transplants in the field. Inspect transplants growing in the greenhouse regularly. If transplants are purchased, inspect them carefully upon delivery. It may be necessary to obtain an official diagnosis if questionable symptoms are observed. The use of fungicides may reduce the spread of some of the diseases mentioned above from plant to plant, but are no substitute for prevention. If fungicides are used, be sure to check the label for information about rate, Restricted Entry Interval etc. Not all fungicides are labeled for greenhouse use. See page 43 in the Midwest Vegetable Guide for Commercial Growers (org) for more information on greenhouse fungicides/insecticides. The list of diseases discussed here is not exhaustive. It is certainly possible to encounter other diseases. For more information contact Dan Egel.